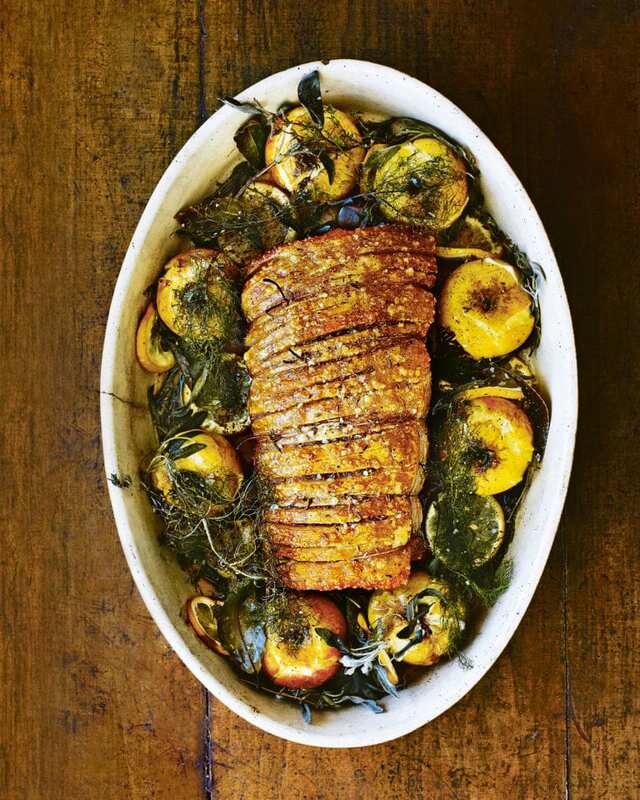 Try Gill Meyer’s one-dish recipe for succulent roast pork and crispy crackling, cooked with apples and seasoned with fennel seed, sage, lemon and thyme. This recipe is taken from Gill’s book Time: A Year and a Day in the Kitchen. Heat the oven to 230°C/210°C fan/gas 8 or as hot as it will go. Put the pork (with its very dry skin) in a suitably sized roasting tin. Season all over with salt, then transfer to the hot oven and roast for 25-30 minutes. Once the crackling is looking good, remove the pork and turn the oven down to 190°C/170°C fan/gas 5. Scatter the red onion wedges over the base of a large, clean ovenproof dish. Carefully lift the pork from its hot roasting tin and set it down on top of the onions. Put the whole apples around the pork, arrange the lemon slices in between them, scatter over the sage leaves, bay, thyme and fennel fronds (if using) and season well with salt and pepper. Sprinkle over the crushed fennel seeds and drizzle everything with the olive oil. Remove the dish from the oven and rest the meat in a warm place for 10-15 minutes. Serve everyone a few thick slices of pork, some generous strips of crackling, an apple and some lemony, herby juices.